The process of planning and preparing for an Office 365 implementation is not linear but is iterative. Luckily, if you use a partner, that partner will have been through this iterative cycle many times with other customers and can make the process much easier than undertaking the process on your own. For example, you do not plan and then stop planning and move into preparing, and then stop preparing and move into migration. Instead, it is an iterative process in that you know what you know at the time and you will know more later on down the road. Microsoft provides the ability to find a partner on their Office 365 product page. Simply click the Support tab and then choose Find a Partner from the menu. 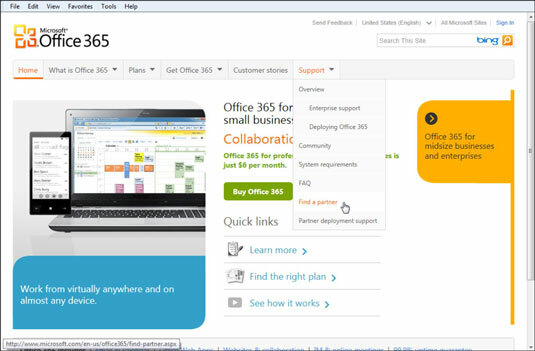 The Find a Partner link takes you to the Office 365 Marketplace. The Office 365 Marketplace lets you search by the top Office 365 Microsoft partners, recommended deployment partners, or by searching for a partner name directly in the search menu. The results use Microsoft Bing to show you the geographic location of each partner, as well as ratings and reviews. Reading the reviews and doing your homework can pay huge dividends when it comes time to implementing Office 365. An experienced partner can make the process seem like a dream, whereas an inexperienced partner can taint your view of the Office 365 product forever.